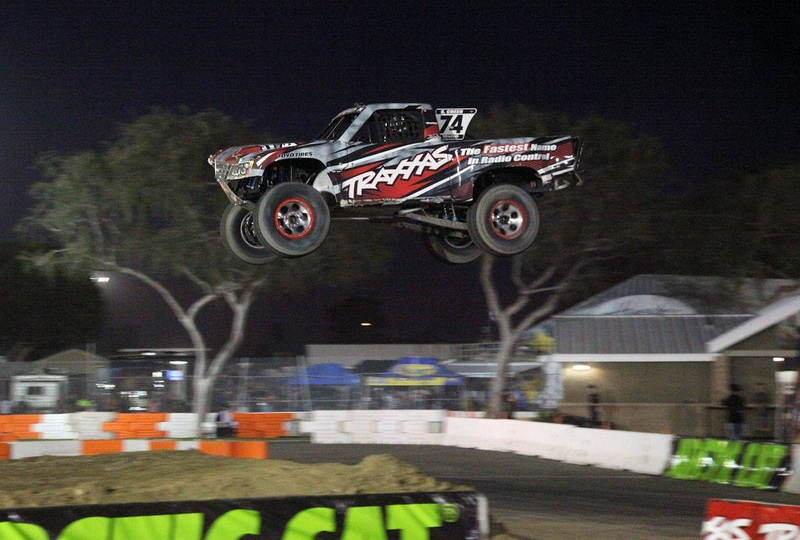 Sheldon Creed Wins Stadium SUPER Trucks Night 2 in Costa Mesa, Calif.
COSTA MESA, California (Sept. 20, 2015) – TRAXXAS driver Sheldon Creed started on pole for Saturday’s SPEED Energy Stadium SUPER Trucks Presented by TRAXXAS race, and cruised to his fourth victory of the season in convincing fashion. While Creed was by himself out front for the first half of the race, the battle was heated directly behind him. California native’s Robby Gordon and Burt Jenner were in a fierce battle with Scottsdale, Arizona’s PJ Jones swapping position’s lap after lap with good clean hard racing. Jenner would move ahead of Jones launching through the sand pit to gain an advantage over Gordon and Jones who collided with each other and lost ground on the frontrunners. The competition caution would fly at the halfway point of the race eliminating the large lead that Creed had developed. With Jenner and Jones on his rear bumper Creed would have to use strategy when taking the joker lane for it to work to his advantage. Jones and Gordon would use the joker on the restart and blasted to the lead ahead of Creed and Jenner. Although from the start of the night, it was apparent it would be Creed’s night. After loosing the lead after the competition caution to Jones, Creed remained calm and saved his joker pass for just the right time to motor back past Jones en route to victory. Last night’s winner Jones came home fourth in the TRAXXAS truck, with Bill Hynes and his LIVE/UFD truck finishing fifth for second consecutive night. Augie Lerch, Charles Dorrance (Sportsman’s Guide), Aaron Kaufman (Toyo Tires), Scotty Steele (LIVE/UFD), and Mad Mike Whiddet (LIVE/Think Loud Recordings) rounded out the field. Jones with his fourth place finish and victory on Friday night captured the overall win. Creed with his victory moves one step closer to an SST Championship as he moves back ahead of Gordon in the 2015 SST Championship standings. The short course at the OC Fair & Event Center was by all accounts one of the best layouts in the history of the SST series, which produced amazing racing and constant action for the capacity crowd. Fans saw a full slate of racing including SST Traxxas trucks, the debut of the Stadium Side x Side Series Powered by Arctic Cat, Class 1400 trucks, Trophy Karts, and the Crusty Demons Freestyle MX all on the dirt and asphalt surface. Race No. 3 of the SST weekend will be Sunday afternoon at the OC Fair and Event Center with the gates set to open at 10:30 am and the first green flag to fly at 11:30 AM. – 2015 is the third season of SPEED Energy Stadium Super Trucks by TRAXXAS. – The first SST race was held at University of Phoenix Stadium on April 6, 2013 and was won by off-road racing veteran Rob MacCachren. – The first event of the 2015 SST season featured three races in Adelaide, Australia with E.J. Viso, Sheldon Creed and Keegan Kincaid taking victories. – Rounds 4 and 5 of the 2015 season took place at the St. Petersburg Grand Prix in Florida and were won by Sheldon Creed and Burt Jenner. – Round 7 at the Detroit Belle Isle Grand Prix was won by Robby Gordon. Round 8 was won by E.J. Viso, while Burt Jenner won the final round and was crowned the overall weekend champion. – The SST by Traxxas series will race with the Verizon IndyCar series four times in 2015 – the St. Petersburg, Long Beach, Belle Isle Detroit and Toronto Grand Prixs. – The SST by Traxxas series also races at venues including sites along the Las Vegas Strip, in stadiums and at purpose-built courses held in conjunction with large festival-style activities. – The Stadium Super Trucks raced in Barbados in December 2014 as part of the International Race of Champions. – The Stadium Super Trucks made their X Games debut with overwhelming popularity in 2014 and were featured live on ESPN and ABC. – PJ Jones claimed his third SST Victory in three years with Round 13 at Costa Mesa, Calif.
– Sheldon Creed captured his fourth victory of 2015 in Round 14 at the Sand Sports Super Show in Costa Mesa, Calif.
– The SSTs are identically prepared 600 horsepower purpose-built race vehicles, modeled after their Traxxas radio control namesake. – At every SST event, fans can test and purchase Traxxas RC cars and trucks at the Traxxas display. At OC Fair & Event Center display and “Try Me Track” is located in the paddock which like the SST paddock is open to general admission ticket holders. – Every SST truck competes on unmodified DOT-approved Toyo Tires. A fan can purchase the same Toyo A/T Open Country 35×12.5xR17 tires for their truck or SUV. – Various SST by Traxxas videos, which have generated more than 10 million views since Dec. 1, 2014, can be seen at www.facebook.com/stadiumsupertrucks. Round 14 Results: Costa Mesa, Calif. 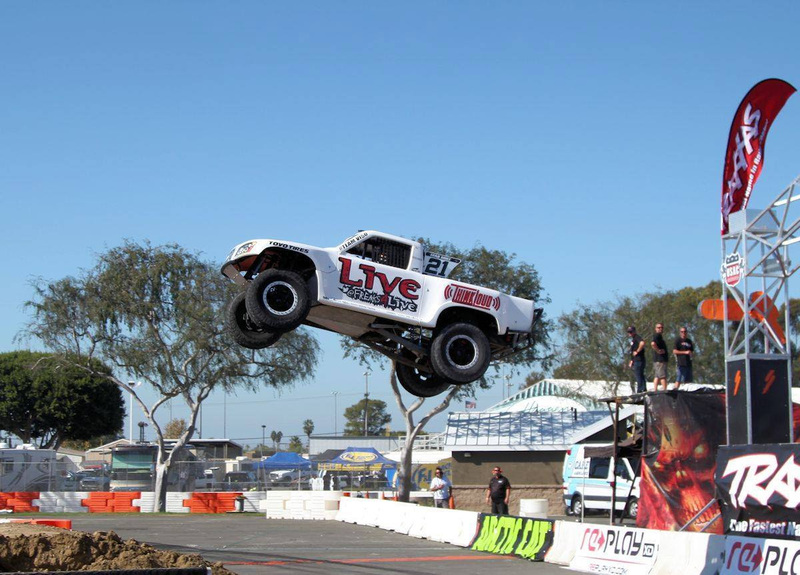 Influenced by the former Mickey Thompson Stadium Off-Road Racing Series, where drivers such as Gordon, Casey Mears and six-time NASCAR champion Jimmie Johnson got their start, Gordon created SST in response to the public’s overwhelming interest in trucks and off-road racing. His plan to re-launch the former stadium series has led to exciting racing on both asphalt and dirt, while producing one of the most extreme forms of action sports today.Other than the trucks launching 20 feet in the air covering distances more than 150 feet, what sets the SST program apart from other series is the fact that all the SST trucks are identically prepared and delivered to drivers in race-ready condition. Race winners are decided by driver skill rather than individual team engineering and budgets. Drivers and their personal mechanics are assigned specific SST mechanics who together tune and make minor adjustments to the 600-horsepower trucks.